Lovers at twilight viewing Prague Charles Bridge. 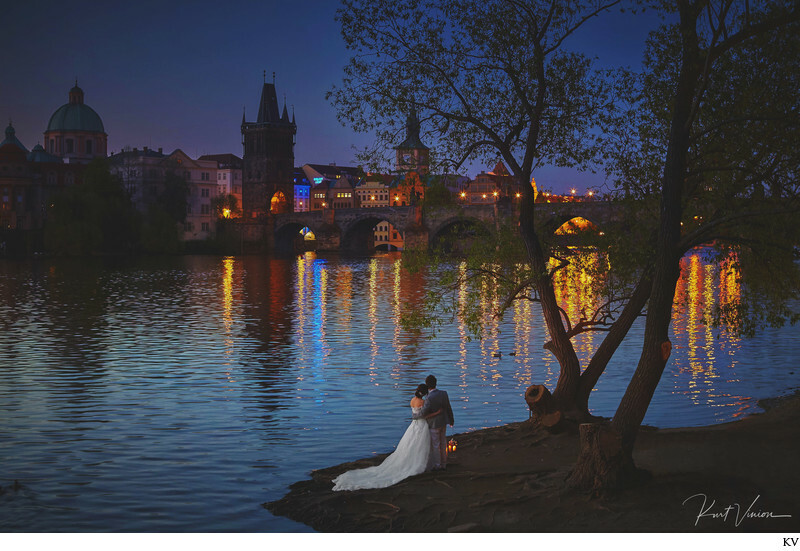 For many of our couples traveling over from Hong Kong, nothing short of perfection will do on their Prague pre-wedding photo session such as this photo. Having a series of art directed, night time creative portraits has become the new standard in pre-weddings. Photographed very early in the am, this portrait of a young couple in their wedding attire snuggling up holding Middle Eastern Candles is one of those images that our clients have requested. Though we do not recreate the same images over and over we will try something new so that every time we both create and capture a pre-wedding portrait it is unique to that particular couple. Photography by Kurt Vinion with a lighting crew and a full - hair & makeup crew in Prague.